Tastykhana has revolutionized the online food ordering industry in India since its emergence in the year 2007. Tastykhana came up with an idea of delivering food across various cities from number of restaurants. Currently, it offers food service from more than 9000 restaurants across India in various cities. Till date, it has delivered over 600000+ orders online. Online food ordering industry is among one of the fastest growing industry in India and people are now getting towards online ordering mode rather than using phone calls for food ordering. And this is a great opportunity for the team to grab those phone call users. This is a great achievement for a company which just started with an individual idea of Mr Sachin Bhardwaj, who himself was once searching online for restaurants and could not find anything much of his use over internet. And this only factor inspired him to open his own food service providing website. Started with a personal savings of mere Rs. 2,00,000 , TastyKhana slowly became popular. With their ultimate services, Tastykhana kept on growing and landed among the group of foodie people quickly. Soon after in 2013, a German portal “Delivery Hero” came up with Tastykhana for food delivery service and invested $5 million in it. 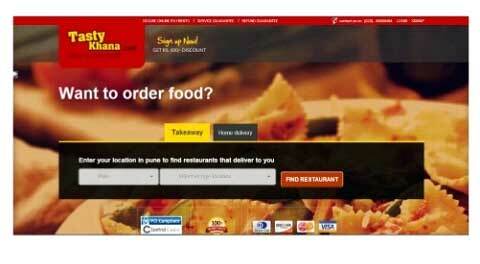 Now, Tastykhana merged with Foodpanda to provide better food ordering services and experience to their customers. 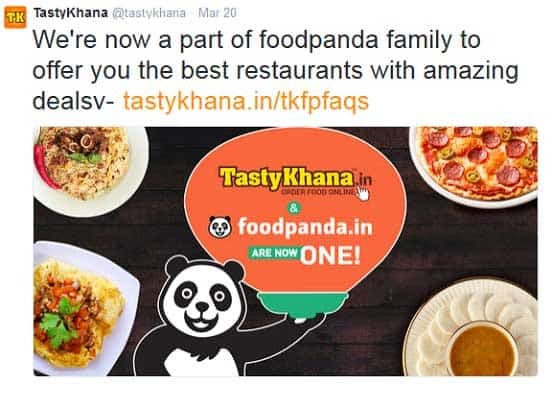 In November 2014, Foodpanda had acquired TastyKhana.in in a process with Delivery Hero which finally has the outcome showing the merging of Tastykhana into Foodpanda in March 2015. 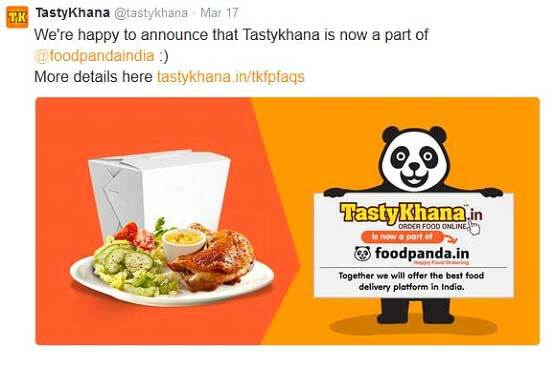 TastyKhana merged with Foodpanda to provide better options and experience of online food ordering service. TastyKhana should be bringing to restaurants new and loyal customers and increase number of orders. Tastykhana.com aims to hit Rs 100 crore mark by the end of 2015. To tap the users still ordering from phone calls and get them in the list of online ordering users. Website Redesigning: Tastykhana keeps a look over their customers and analyses the way a customer thinks while visiting their website. So they keep on changing their user interface to make the user experience better and make order easily. By the end of year their two years in 2009, they generated a business worth INR 10-12 Lacs annually which in 2010 raised to 30 Lacs. In 2011, they did a business of 80 Lacs rising to 2.5 Crores in 2012. With a remarkable climb in the business, Tastykhana generated revenue of 8.5 Crores in the year 2013. Various lucrative contests and promotional offers are hosted using Twitter as their social media platform. These offers are generated in front of the world using regular tweets. There were some tweets from Tastykhana for their customers. We are showing some of them. Tastykhana also keeps a track record of their Facebook user and keeps them up to date with their latest updates about offers and promotions available. Tastykhana.in was awarded with Customer value leadership award for “Online food ordering service” for the year 2014. Customer retention touched 12% from 2% for TastyKhana. Customer acquisition rate increased two times per months. Mobile app downloads increased from 200 to 3700. Website traffic increased 5 times from 800 to 4000 per day. Now you will be thinking of what will happen of your accounts and other information stored at Tastykhana. No need to worry, Tastykhana has done special arrangement for their account holders. Just visit http://tastykhana.in/tkfpfaqs for all the details related with your account, trinkets, refunds or any other issues.